Abstract: Pustular psoriasis of pregnancy (PPP) is a life-threatening condition for both the pregnant mother and fetus, and must be efficiently and accurately diagnosed and treated. 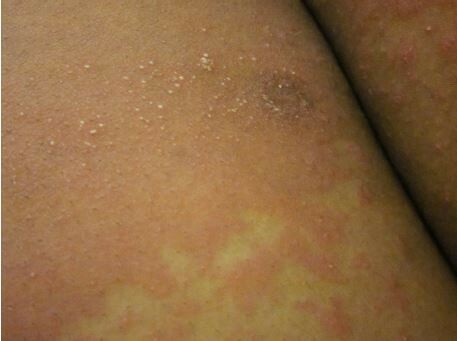 This condition has historically been classified as a unique, separate dermatosis of pregnancy. However, current opinion and data suggest that it may be a variant of generalized pustular psoriasis. PPP typically occurs in the third trimester and is characterized by widespread coalescent pustules, desquamation, and systemic symptoms. Clinical features and histopathologic evaluation aid in diagnosis. Treatments during pregnancy include high-dose corticosteroids, cyclosporine, narrow-band ultraviolet B radiation, infliximab, granulocyte and monocyte adsorptive apheresis, and systemic antibiotics. Both the mother and fetus should be closely monitored with appropriate laboratory studies for the duration of the pregnancy and postpartum.